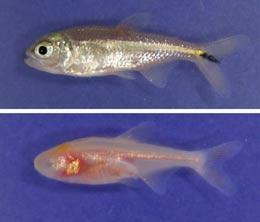 Stories about cavefish are like buses – you get a seeming infinity of nothing and then loads turn up at once. Just 10 posts ago, I wrote about a study which found that you can restore sight to blind cavefish by cross-breeding individuals from different caves. The different populations lost their eyes through changes to different sets of genes and in the hybrids, each faulty version was paired with a working one. As a result, the hybrids had fully formed and functional eyes despite having lived in darkness for a million years. Now, a new study shows that the larvae of blind cavefish can detect light (or more accurately, shadows) too, even without working eyes. They can detect shadows and seek shelter in them, just like the sighted surface-dwelling versions of the same species. The key to the behaviour is their pineal gland, a small organ that regulates the body clock and, in some species, is sensitive to light. I wrote up the research for Nature News; mosey on over for the full story and some possible explanations for why the fish’s pineal has retained the ability to detect light, even though its eyes have been lost. The new edition of the Tangled Bank carnival is up at the Inoculated Mind. Nature Network’s published an interview I did with Alfried Vogler, who studies beetles at Imperial College. Last year, Vogler carried out the most comprehensive ever study on the evolutionary relationships between the beetles, the most successful group of animals on the planet. The natural world is full of alliances forged between different species, cooperating for mutual rewards. The relationship between ants and acacia trees was one of the first of these to be thoroughly studied. But new research suggests that this lasting partnership may be sundered by the unlikeliest of reasons – the decline of Africa’s large mammals. Acacias are under constant attack from hungry animals, from tiny caterpillars to towering giraffes. In response, many species like the whistling-thorn tree (Acacia drepanolobium) recruit colonies of ants as bodyguards. Any hungry herbivores eager to chomp on the acacia’s leaves quickly get a mouthful of biting, stinging ants. The tree is a fair employer. In return for their services, its ant staff receive a sugary and nutritious nectar as food and hollow swollen thorns called ‘domatia’ as board. But this pact is a fragile one. Todd Palmer from the University of Florida and colleagues from the USA, Canada and Kenya have found that it rapidly breaks down if the large animals that graze on the acacia disappear. Without the threat of chomping mouths, the trees reduce their investments in bodyguards to the detriment of both partners. Palmer demonstrated this with plots of land in Kenya’s Laikipia Plateau, where fences have kept out large plant-eaters for over a decade. Since 1995, no herbivore larger than a small antelope has entered the four-hectare “exclosures” in an attempt to study the effect of these animals on the local ecology. Within these 10 years, Palmer found that the majority of trees produced fewer domatia and less nectar and unexpectedly, the strongest alliances were hit the hardest. What were once happy partners quickly became selfish rivals. In the meadows of Europe, colonies of industrious team-workers are being manipulated by a master slacker. The layabout in question is the Alcon blue butterfly (Maculinea alcon) a large and beautiful summer visitor and its victims are two species of red ants, Myrmica rubra and Myrmica ruginodis. The Alcon blue is a ‘brood parasite’ – the insect world’s equivalent of the cuckoo. David Nash and European colleagues found that its caterpillars are coated in chemicals that smell very similar to those used by the two species it uses as hosts. To ants, these chemicals are badges of identity and so similar are the caterpillars that the ants adopt them and raise them as their own. The more exacting the caterpillar’s chemicals, the higher its chances of being adopted. The alien larvae are bad news for the colony, for the ants fawn over them at the expense of their own young, which risk starvation. If a small nest takes in even a few caterpillars, it has more than a 50% chance of having no brood of its own. That puts pressure on the ants to fight back and Nash realised that the two species provide a marvellous case study for studying evolutionary arms races (which I’ve blogged about before here). Theory predicts that if the parasites are common enough, they should be caught in an ongoing battle with their host, evolving to become more sophisticated mimics, while the ants evolve to become more discriminating carers. The two species make a particularly good model for this because their geographical ranges overlap in a fractured mosaic. Look into the oceans past the sharks, seals and fish and you will find the tiny phytoplankton. These small organisms form the basis of life in the seas but if their populations get to big, they can also choke the life from it by forming large and suffocating algal blooms. The waters of San Francisco Bay have never had big problems with these blooms and if anything, scientists worried that the waters didn’t have enough phytoplankton. All that changed in 1999, when the phytoplankton population started growing. It has doubled in size since. Now, scientists from the United States Geological Survey (USGS) have found that the blooms are the result of a long chain of ecological changes in the area. The plankton are just players in a large ensemble drama involves clams, mussels, fish, crabs and a cold snap.